The ‘Tru Plant’ Witches have completed their side for the 2019 Premiership season with the addition of Chris Harris. The Ipswich management have moved quickly to sign the former Grand Prix star and three-time British Champion who won the Premiership title with Poole last season and he finished the campaign with an average of 7.78. 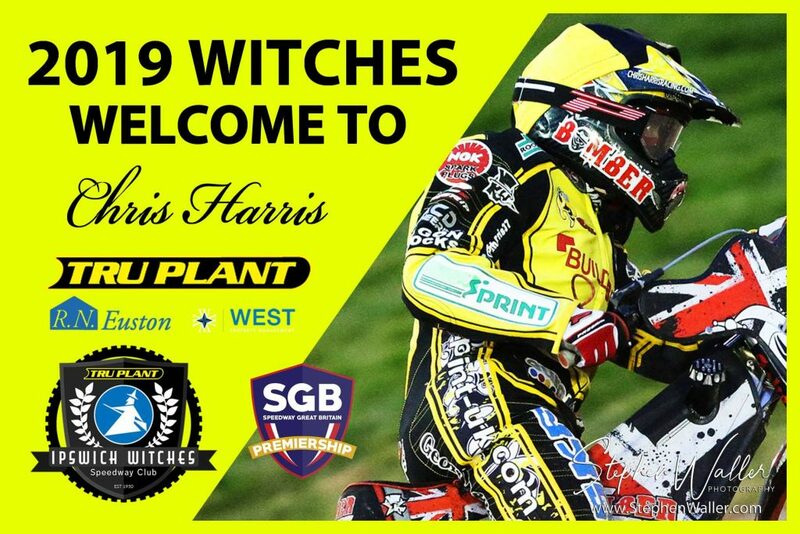 Promoter Chris Louis is delighted to have Harris wearing the Witch in 2019. The Cornish rider is highly experienced at the top level, having competed in 103 Grand Prix, famously winning in Cardiff in 2007 and Louis is hoping his exciting style will provide some memorable moments at Foxhall in the new season. Harris is joined by David Bellego in the new side and Louis is looking forward to working with the Frenchman having had his eye on him for quite a while. “This move has also enabled us to add popular Frenchman David Bellego to the side. David’s first ride on these shores was at Foxhall when he travelled over with his compatriot Mat Tresarrieu and although we were unable to snap him up that time, it is great to finally see him at Foxhall. Krystian Pieszczek, David Bellego, Cameron Heeps and Jake Allen. With team building now complete, attentions turn to the start of the season with fixtures to be released soon as well as news on our sponsors for the new season and Louis can’t wait to get started. 2019 Season Tickets are now available to purchase, all the details can be found here.